(depend on product weight and density) Single Phase, 230 Volts, 50 Htz. 2.5 KW max. (with volumetric filler) 3.5 KW max. (with Augar filler) 775mm (W) x 950mm (L) x 1500mm (H) Approx. Center / Three side / four side seal pouches. 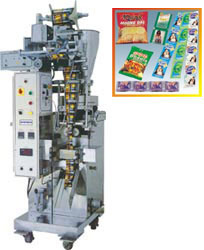 India based Systech has made significant growth as a manufacturer and exporter of high quality and impressively priced automatic packaging machinery, converting machines and allied equipment for discerning buyers around the world. Since its establishment it has constantly redefined and mastered its core competencies through innovation and hardwork. The organization also provide excellent services to industrial houses.